THE BIBLE is none other than the voice of Him that sitteth upon the Throne! Every Book of it,—every Chapter of it,—every Verse of it,—every word of it,—every syllable of it,— (where are we to stop? ),—-every letter of it—is the direct utterance of the Most High! . . . The Bible is none other than the Word of God: not some part of it, more, some part of it, less; but all alike, the utterance of Him who sitteth upon the Throne,—absolute,—faultless,—unerring,—supreme! Fathers of the Church, such as Saint Augustine, used this approach to the Bible freely. 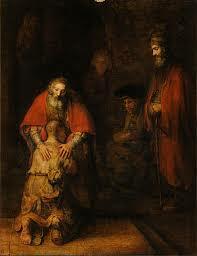 Suppose we were to imitate them this morning and apply their methods to the parable of the prodigal son, today’s Gospel. First, what is its literal sense? That’s easy: the story is about forgiveness for the repentant sinner, the younger son. This message is exemplified by the father in the story and re-enforced by the passage with the older son. But now the fun begins, as we investigate the parable with the fuller sense, according to which, as we have seen with “Jerusalem,” the parable can be read in several ways. For we can interpret it with regard to Christ and his Church; but we can also apply it to the individual Christian, to each one of us; or, again, we can treat it as symbolic of the end of time. What happens when we read it, for instance, as symbolic of the Church? Let’s see. The parable opens with the words, “A man had two sons.” The man would be God, and the older son would represent the Jewish people who were “the first to hear the word of God.” The younger son, therefore, must stand for non-Jews, i.e., the gentiles. He receives, we are told, a share of his father’s fortune. In our interpretation, that would correspond to a twofold boon that God has bestowed even on pagans: first a moral instinct, which they identified as conscience, and secondly intelligence, by which they recognized that the world had been created by God. The younger son dissipated this noble inheritance; that would indicate the decline in antiquity of religion into superstition, idolatry and sensuality. The famine in the land suggests a sterility of thought that became more and more incapable of directing and encouraging man to practise virtue. The parable states that the young man would have gladly eaten with the pigs, for the fact is that without God the rational human descends to the level of the irrational beast. His coming to his senses is the gradual recognition that something has gone horribly wrong with the human condition and that the remedy for it is to be found in his father’s house. As the younger son limps towards home, the father sees him from afar, indicative of the decision of the early Church to reach out to the gentiles by offering them access to the one true God, the God of Abraham, Isaac and Jacob. How appropriate, then, is the son’s speech: “Father, I have sinned against heaven and against you. I am no longer worthy to be called your son.” These words express a fact that all Christians accept, whether they are Protestant, Orthodox or Catholic, namely, that the grace of conversion is a gift that comes freely from God and which we could do nothing to deserve. This parable stops at this point, although we would all like to know something about their subsequent history. What would these sons have been like twenty or thirty years later? Well, the story is open-ended because we must complete it in our lives by thinking about it and by acting upon its message.As I mentioned earlier, this symbolic reading of this parable, like the city of Jerusalem, could be applied to the individual Christian and also final state of things, when Christ will have come again. I, however, have spoken long enough for this morning. Perhaps in three years, when this reading recurs, I shall be back in the pulpit to explore with you one of other interpretations of the prodigal son. J.W. Burgon, Inspiration and Interpretation (Oxford, 1861), p. 9. Augustine’s interpretation of the parable of the prodigal son can be found in his treatise Quæstionum evangeliorum libri duo, II.33 (PL XXXV, 1344-48).